Plumbr today launched an Application Performance Management product that automatically reports which technical errors are the root cause for end-user impacting performance incidents. With this release Plumbr becomes the only monitoring solution that not only detects performance incidents, but also links them to technical errors in source code that cause them. This approach improves the SLA of business critical Java-based applications and decreases Mean Time To Resolve for detected performance problems by 75%. The product works by monitoring the performance of different services of the application (e.g. login, confirm payment, open list of payments, etc). When the whole application or any of the services become slow or non-responsive, Plumbr sends an alert by e-mail or via any of the integrated services. The alert contains a link to the technical error that causes the problem. Plumbr root cause report allows engineers to quickly fix the problem and rids them of the need to reproduce and analyze it in more detail. As of today, the new feature will be available to all paying customers, as well as to everyone who join’s Plumbr’s 14-day trial program. 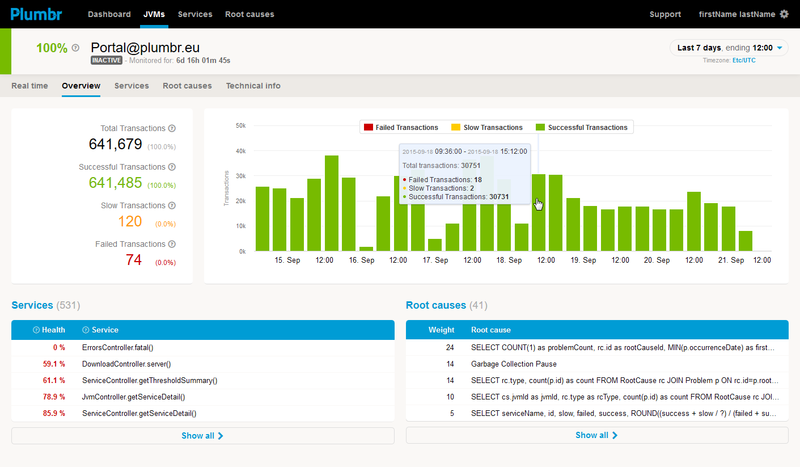 Plumbr is the only java performance monitoring solutions that automatically detects the root causes of performance issues. The company was started in 2011 and has offices in Estonia and Boston, MA. Plumbr customers monitor business critical Java applications globally and include NASA, Dell, VMware, EMC Corporation, and others. Learn more at https://plumbr.io. Are my end users happy with the application? Which parts of application perform the worst? Which technical problems impact my users the most? How fast is my service for end users? Where is the problem in source code?